The value of purchases by banks operating in Saudi Arabia from foreign exchange during the year 2018 was about 2.88 trillion riyals, registering a decline of 2.1 percent that worth SR 62.6 billion compared to SR 2.94 trillion in 2017. According to an analysis of the report's unit in the newspaper AlEqtisadiah that based on the data of SAMA, the decline in bank purchases of foreign exchange is due to several factors, which is led by a decline in demand from bank customers in general by 7.7 per cent. Foreign remittances decreased by 4 per cent and imports by 10 per cent declined during the last year 2018. According to the analysis, the purchases of foreign exchange banks came across five sources, as the first is foreign banks accounting for the largest share of total purchases, representing 48.4%, worth 1.39 trillion riyals. Thirdly, bank customers at 14.6 per cent, while fourth came local banks, and fifth is other sources. 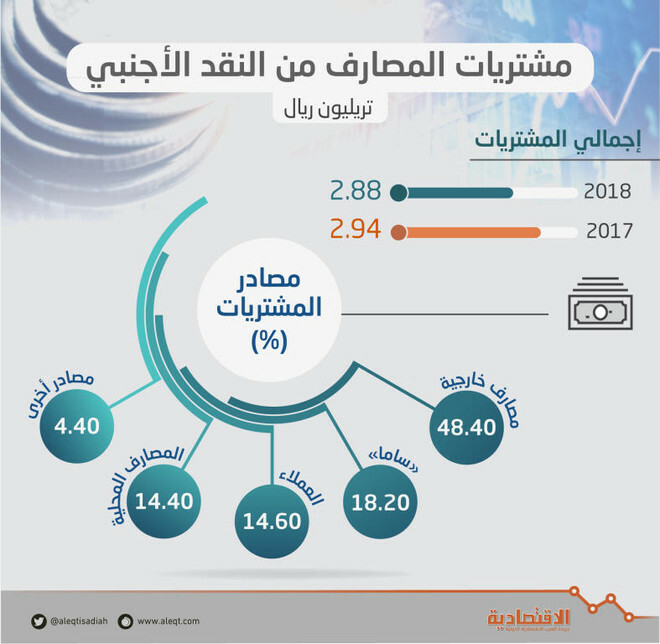 The sales of banks from foreign exchange during the last year 2018 were about 2.65 trillion riyals to retreat from what it was during 2017, which amounted to about 2.84 trillion riyals, and a difference of 194.9 billion riyals. Commercial banks sell and buy foreign currencies in order to provide sufficient cash to cover the needs of their customers, especially importers. The profit from these operations is also intended to be the difference between foreign exchange buying and selling prices if the purchase price is lower than the selling price, even if the selling price is equal to the purchase, which gives the bank the opportunity to buy without a discount at the very least. This service is part of the bank transfer services provided by banks to their customers. The banks practice buying and selling foreign currencies either present or for the last known cash or forward transactions. While the sales of banks from foreign exchange during the last year 2018 to several parties, most notably customers of banks at home by about 40.6 per cent, was about 42 per cent for foreign banks, about 5.1 per cent for foreign remittances and about 3.9 per cent for import financing.